Click here to send a message to us all! Yes, there really is an Art! Here he is! The man who began it all. We’ve got a page dedicated to his legacy, and you can read more here. Art is the driving force behind the shop. He has managed to build an excellent reputation by being honest and explaining auto repair to his customers. He has the ultimate in positive attitudes. Over the years, he’s saved hundreds of cars other mechanics had given up on and condemned to the scrap heap, making him a hero to many of our customers. Art drives a CRZ hybrid and a Lexus CT200h Hybrid. Accountant. Wine connoisseuse. Bocce ball Queen. Long time customers will remember seeing her in the office a lot, but lately she’s been spending more time upstairs taking care of the bookkeeping, making many of our customers sad. If you call the shop, you’re likely to hear her voice answering phones and helping with scheduling. Everybody likes Ann. She has been with Art nearly since the beginning. She is an avid wine collector, and works part time pouring tastings in a local winery. Ann drives an Honda Accord and a Mercedes Sedan. Technician. Diagnostic Expert. Guitar Collector. He is the best drivability diagnostician I have ever met. He does almost nothing but drivability and smog failure diagnosis all day. Every shop needs a “Brad”, but most do not have one. He’s one of the reasons we’re so successful. Brad is an ASE master technician. He is also a collector of many things, and has his California Curio and Relic license that allows special handling of antique firearms and other oddities. Brad drives a 1.8L Subaru. Shop Foreman. Manager. Hybrid Expert. Paul wrote most of the articles featured on this site. He is a graduate of Los Angeles Trade Technical College, an ASE certified Master Technician + L1, Master Machinist (M1,M2, & M3), certified Alternative Fuels Technician (NGV), and certified Service Consultant. Paul has filled every position, from mechanic to manager. He most enjoys challenging technical work, and is our primary “problem solver” who has figured out and fixed many complicated Hybrid failures that various dealerships could not successfully diagnose. He is also a published automotive trade writer, and you can read various articles at mastertechmag.com. General Manager. Service Writer. Skateboarder. Lute was a bank manager at Wells Fargo where Art had an account. When Art would come in to make a deposit, Lute would ask automotive repair questions. After years of questioning from Lute, the do-it-yourself bank manager, Art, who considered Lute the best employee in the bank, tried to lure him away. After being asked twice, he finally came to work for Art. We (and you) are lucky to have him. Lute will explain every facet of any auto repair in depth to anyone with the time and inclination to listen. Lute is an ASE certified Master Technician with the L1 advanced level specialist. These days he manages the daily business operation and you will meet him in the office. He also writes the white pages you will find at our counter, and has contributed articles to the site. Lute drives an Acura Legend, Toyota Tacoma or a Honda CBR-954RR. Shop Handyman. Equipment Specialist. News Barker. Leon is a sports fan and loves to give other sports fans a hard time when their teams lose. Leon has a lot of duties. He cleans the shop, maintains the equipment, picks up parts, installs tires, changes oil, builds shelves, paints and does whatever else is needed to make the day go smoothly and the shop look nice. He also knows everything that’s going around in the Bay Area news, and is the first one to let us know what’s happening in our community. Leon drives a Honda civic. Technician. A/C Expert. History Buff. Ivan is an excellent diagnostic mechanic, but can also do any other type of service or repair work we throw at him, making him a very versatile employee. Ivan is an employer’s dream: He works hard all day (and beyond when necessary). He owns the largest tool collection in our shop, including many tools normally purchased by the shop owner. He voluntarily participates in after-hours training. And he has a good attitude, even when the pressure is on. Ivan’s last job was at a Toyota dealer, where he gained Hybrid experience. Ivan gets 40+mpg with his 1991 Civic Hatchback. Technician. Balanced Mechanic. Mountain Bike Guru. Scott used to work right down the street from us at Weatherford BMW, until he opened his own shop in Moraga. Now we’re lucky to have him here at Art’s Automotive. Scott is a mechanic who knows all aspects of the auto repair business, and this allows him to anticipate and respond to questions without having to be asked. Like most of the small business owners I’ve met, Scott remains very focused on his work all day. Scott is an ASE certified Master Technician and is an L1 Advanced Engine Performance Specialist. Scott is also certified to repair air conditioning. Scott drives a Honda Civic. Parts Manager. Systems Administrator. Nerd. My name is Chris, and I am the parts manager as well as the IT guy here at Art’s. I graduated from UC:Berkeley, and after a bit of down time, came to work for Art’s in 2007 to take over Paul’s old job so he could become our lead technician. You may see me in the office since I do service writing as well. I’m ASE certified. The website is my design! I am a published author for Nissan’s technical trade magazine, and enjoy balancing creative endeavors with the logical processes of automotive repair. I drive a 2003 Honda Civic. Technician. 4×4 Enthusiast. Racer5 Afficionado. Morgan recently came to us from his shop downtown. He is an ASE Master Technician, with L1 advanced certificate and his California Smog license. Morgan seems to have an innate sense of how cars work, and is almost like some sort of car whisperer! His experience with other types of vehicles has also brought a unique outlook to performing service and repair to this shop. Morgan drives a 2000 Toyota Corolla with under 30k! Mike has been in the automotive industry for 25 years now between various independents and dealerships. He is an ASE Master Technician, with the L1 advanced specialist certificate. Mike is patient and capable, and willing to learn about all the advanced systems we work on here. He has been great so far at balancing his workload and producing the high quality of workmanship we expect from the technicians here at Art’s. Mike also enjoys the great outdoors, and once caught an enormous sturgeon weighing over 70lbs! Mike drives a Dodge Ram truck. Chris was hired on as our oil change guy, but it quickly became apparent that his talents far exceed the position we hired him for. The bad news is we’ll need to find another oil change guy some day. The good news is that Chris can fill in the gaps for virtually any position here at Art’s. You may meet Chris in the office or on the phone since he has great customer service skills. Or he may be the one who figures out what’s wrong with your hybrid, since he aced the Advance Hybrid course at Contra Costa College, scoring 98% on the final. 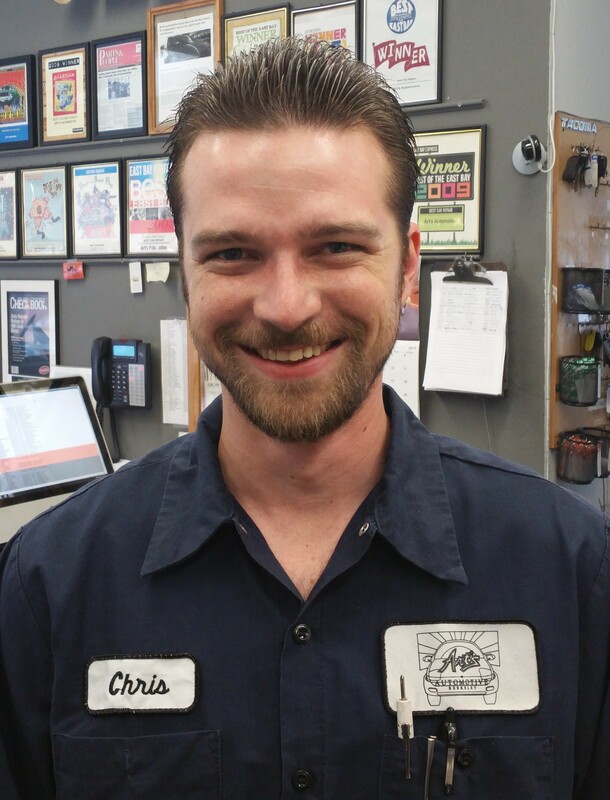 Chris has demonstrated consistent attention to detail and when he does an oil change it’s more like a mini-service. When Chris replaces your motor oil, you’ll get more than you’re paying for. Chris has the following ASE certifications: A1, A3, A4, A5, A6, A7, and A8.